"Jeannie Cho Lee" has rated the wine "Tenuta Tignanello 'Marchese Antinori' Riserva, Chianti Classico DOCG, Italy" the vintage 2007 on 01.11.2012 with 86 of 100 points. "Wine Spectator" has rated the wine "Tenuta Tignanello 'Marchese Antinori' Riserva, Chianti Classico DOCG, Italy" the vintage 2013 on 15.10.2016 with 93 of 100 points. "Wine & Spirits Magazine" has rated the wine "Tenuta Tignanello 'Marchese Antinori' Riserva, Chianti Classico DOCG, Italy" the vintage 2011 on 01.04.2016 with 88 of 100 points. "Wine Enthusiast" has rated the wine "Tenuta Tignanello 'Marchese Antinori' Riserva, Chianti Classico DOCG, Italy" the vintage 2013 on 06.01.2016 with 89 of 100 points. "Wine Spectator" has rated the wine "Tenuta Tignanello 'Marchese Antinori' Riserva, Chianti Classico DOCG, Italy" the vintage 2011 on 31.10.2015 with 91 of 100 points. "Wine Spectator" has rated the wine "Tenuta Tignanello 'Marchese Antinori' Riserva, Chianti Classico DOCG, Italy" the vintage 2012 on 31.10.2015 with 88 of 100 points. "Wine Enthusiast" has rated the wine "Tenuta Tignanello 'Marchese Antinori' Riserva, Chianti Classico DOCG, Italy" the vintage 2012 on 09.01.2015 with 92 of 100 points. "Wine Spectator" has rated the wine "Tenuta Tignanello 'Marchese Antinori' Riserva, Chianti Classico DOCG, Italy" the vintage 2010 on 15.10.2014 with 90 of 100 points. "Vinous Antonio Galloni" has rated the wine "Tenuta Tignanello 'Marchese Antinori' Riserva, Chianti Classico DOCG, Italy" the vintage 2011 on 01.09.2014 with 89 of 100 points. "Wine Spectator" has rated the wine "Tenuta Tignanello 'Marchese Antinori' Riserva, Chianti Classico DOCG, Italy" the vintage 2009 on 30.04.2014 with 88 of 100 points. "Falstaff Magazin" has rated the wine "Tenuta Tignanello 'Marchese Antinori' Riserva, Chianti Classico DOCG, Italy" the vintage 2010 on 14.02.2014 with 92 of 100 points. "Wine Enthusiast" has rated the wine "Tenuta Tignanello 'Marchese Antinori' Riserva, Chianti Classico DOCG, Italy" the vintage 2009 on 04.01.2014 with 89 of 100 points. "Wine Spectator" has rated the wine "Tenuta Tignanello 'Marchese Antinori' Riserva, Chianti Classico DOCG, Italy" the vintage 2008 on 31.08.2013 with 90 of 100 points. "Vinous Antonio Galloni" has rated the wine "Tenuta Tignanello 'Marchese Antinori' Riserva, Chianti Classico DOCG, Italy" the vintage 2009 on 01.08.2013 with 91 of 100 points. "Falstaff Magazin" has rated the wine "Tenuta Tignanello 'Marchese Antinori' Riserva, Chianti Classico DOCG, Italy" the vintage 2009 on 15.02.2013 with 91 of 100 points. "Wine Spectator" has rated the wine "Tenuta Tignanello 'Marchese Antinori' Riserva, Chianti Classico DOCG, Italy" the vintage 2007 on 30.09.2012 with 90 of 100 points. "Vinous Antonio Galloni" has rated the wine "Tenuta Tignanello 'Marchese Antinori' Riserva, Chianti Classico DOCG, Italy" the vintage 2008 on 01.09.2012 with 91 of 100 points. "Falstaff Magazin" has rated the wine "Tenuta Tignanello 'Marchese Antinori' Riserva, Chianti Classico DOCG, Italy" the vintage 2008 on 10.02.2012 with 92 of 100 points. 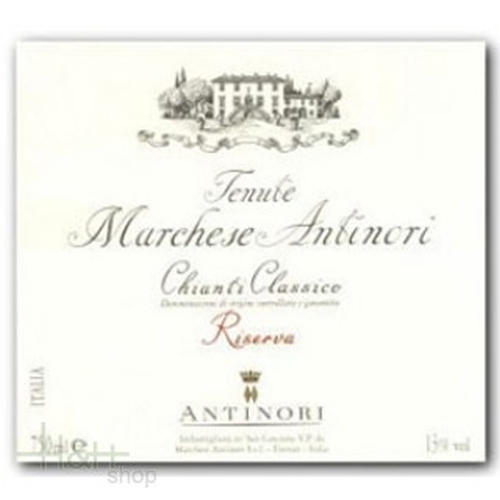 "Wine Enthusiast" has rated the wine "Tenuta Tignanello 'Marchese Antinori' Riserva, Chianti Classico DOCG, Italy" the vintage 2007 on 05.01.2012 with 89 of 100 points. "Vinous Antonio Galloni" has rated the wine "Tenuta Tignanello 'Marchese Antinori' Riserva, Chianti Classico DOCG, Italy" the vintage 2007 on 01.08.2011 with 91 of 100 points. "Wine Spectator" has rated the wine "Tenuta Tignanello 'Marchese Antinori' Riserva, Chianti Classico DOCG, Italy" the vintage 2006 on 15.10.2010 with 90 of 100 points. "Wine Spectator" has rated the wine "Tenuta Tignanello 'Marchese Antinori' Riserva, Chianti Classico DOCG, Italy" the vintage 2005 on 15.10.2009 with 91 of 100 points. Dark and intense ruby red with an ample and complex nose yielding ethereal spices, cherry, blackberry preserves, rosemary, tobacco and cinnamon with light hints of vanilla. Dry on the palate and full bodied with firm tannins and alongfinish. Although a young wine when released, it is destined for a great future! Sparkling Wine Quality South Tyrol Arunda Vivaldi Brut metodo classico 75 cl. The BRUT, capable of bringing harmony into the differences of this territory, it's distinguished by a classical cuvée of Chardonnay (80%), Pinot Nero (10%) e Pinot Bianco (10%); fermentation takes place in stainless steel tanks. The refinement in bottles lasts for 24 month. The Brut is the Franciacorta that includes all the results of the VINEYARDS ESTATES. Valpolicella Classico Superiore - 2015 - Winery Musella 18,35 EUR / 24,47 €/lt. Barbaresco Coste Rubin - 2010 - cantina Fontanafredda 37,95 EUR / 50,60 €/lt. Liber Pater Ciró Rosso Classico Superiore - 2007 - Ippolito 1845 12,25 EUR / 16,33 €/lt. Nebbiolo D'Alba Drago - 2016 - Poderi Colla 19,65 EUR / 26,20 €/lt.